THE SKINNY: There's nothing like that super-fresh creamy cucumber smell. And Fresh Lotus Youth Preserve Face Cream has it. The creamy moisturizer goes on smooth and creamy, smells fantastic and is already doing a great job of beating down my increasingly dry skin. Fresh claims this cream will provide 24 hours of moisture thanks to a special, proprietary complex. Many of the ingredients sound fancy, but it does contain Vitamins C and E (my wonder ingredients), and works. This would seriously be a four-star product, but I dinged it just a little because of the price tag. CHECK IT OUT: It's not just me. 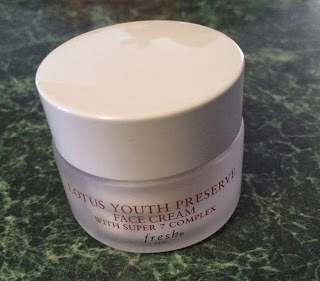 Fresh Lotus Youth Preserve Face Cream seems to get great reviews all around and is from a brand that we at Beauty Test Dummies really like.